Ask fellow campers about "Whippoorwill Campground" and nearby attractions. 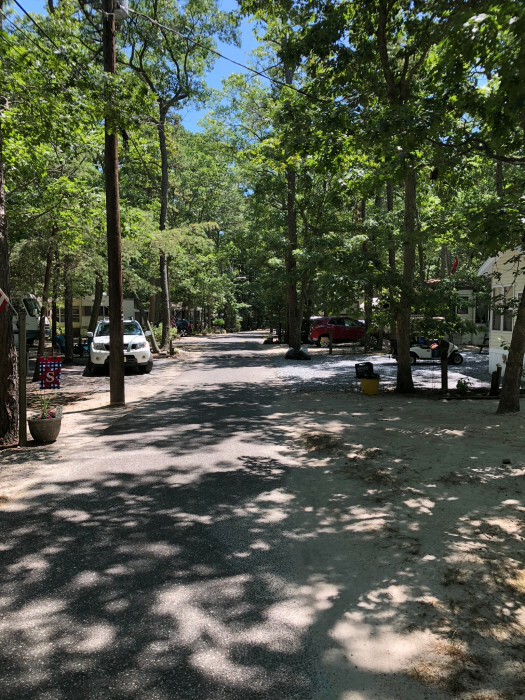 A very wooded campground with plenty of activities and great location if you have family/friends staying in south Ocean City, NJ. Staff was very friendly and helpful. Site was very clean with abundant shade and sufficient distance from neighboring sites. Predominantly filled with permanent trailers, the park dedicated areas for tents and full-hookup RVs. Pool is large and in great condition. Only concern would be for large trailers - no pull-through sites means you have to back in while minding trees on both sides of the site. We camped at Whippoorwill Campground in a Motorhome. We decided after staying at this campground for several years, to come for the entire season in 2016. It is very helpful to explain the size of your rig for them to place you in the best location giving you the easiest access. Roads and turns are well maintained, however certain areas can be tight for a 4o foot diesel coach. The best sites for a large rig are around site 295. The location of this park is ideal for access to all of the beaches in South Jersey while still being a short ride from the AC Expressway. We have found this park to be the best option at the Jersey shore, so much so, that we have sold our RV and have built a park model on a seasonal site. The staff has been extremely helpful. We camped at Whippoorwill Campground in a Motorhome. When making your reservation, be very clear about the size of your rig and your personal driving and backing ability. If you are a large coach, the easiest navigation is through the road to the left of the entry. People have complained about the narrowness of the roads, however, in the middle of the summer, shade from the trees makes up for the initial navigational challenges. If you are towing: disconnect before entering the park. Whippoorwill raised the price this year, which isn't so bad for the proximity to OCNJ. The service and cleanliness are still top notch. We have been staying here for a number of years and, now that I have a larger camper, I must say that the trees and signs located on the very edges of every road make for a hazardous finale to our trek to Whippoorwill. It is stressful to tow in the park and backing in can be a challenge (to be kind) in some spots. I had to request a site change, as Site 18 is a bear to land our 28' travel trailer. Beach tag rental is a nice option, but I was none too pleased to be charged for an extra day when I turned them in at my checkout day/time. Apparently, they are due by 9am and 11am on checkout day nets you a one an additional days rent. In the end it was an extra $6, but I hate being "nickel and dimed" for something that I do not recall being told. Thankfully the ridiculous gates were out of service again, as seems to be the case on every visit. This time they removed the turnstiles. So, at least safety, was restored. Whippoorwill is a fine campground, but I think it is time to shop around for future visits. We camped at Whippoorwill Campground in a Travel Trailer. A heavily wooded campground conveniently located near Ocean City, NJ. Staff quite friendly, although male teenager who escorted us to our site was useless - didn't speak a word of advice or guidance while we parked the RV. A large quality pool, recreation area and snack bar are available. We'll be back. We camped at Whippoorwill Campground in a Motorhome. If you've got a big rig or trailer, let them know in advance so they can get you a site that's easy to park. With so many trees, some sites are virtually impossible to park. Short hop over the 34th Street bridge to Ocean City NJ. Very level, all sand sites...of course it's South Jersey. Mostly seasonal, but they are so well kept that it makes for very enjoyable long walks around the campground. Off-island camping is always buggy in the summer. Asian Tiger mosquitoes will get you during the day. Be prepared. Olympic size pool is open to the public (for a fee) and it is fun to watch the kids swim team practice. Everything that you need is nearby and it is nice to leave the beach and avoid the crowds at the end of your day. They rent beach tags which is very helpful and save a lot of money. Bring cash as you will need to leave large deposit for beach tags and key cards. But, it's nice to have that back in your pocket for your return home. The only complaint that I have is with their turnstiles for entry and exit. They often malfunction. On our last trip, the power went out. Thank God for 12V battery and a tank full of fresh water. But, the turnstiles failed and there was no way to enter or exit the campground. Now, that's a small inconvenience for a vacationer. But, if an ambulance or fire truck must wait for someone in the office to run down and manually remove the turnstile, then there could be a dangerous situation. They really need to remove these stupid turnstiles, or at least the exit turnstile. It really doesn't serve much purpose other than to annoy. We camped at Whippoorwill Campground in a Travel Trailer. Nearby Chinese food is pretty darned good, with 2 choices available. Island Shore or Fai's. Chinese food isn't easy to get down the Shore. So, this is a bonus. Plus there is always the Lobster House in Cape May. Skip the middleman and buy your seafood here...or eat outside (less expensive) or inside (more expensive). We loved staying here. Lots to do, swim, bingo, crafts and the beach is close. Sites are kinda close together but large. People were very nice and accommodating. We would stay here again. We camped at Whippoorwill Campground in a Travel Trailer. Best thing about our stay was the location. Traveling in a big rig towing a car, the roads are tight and tree limbs are low. Very heavily wooded sites with still too many trees on each site to comfortably back in a big rig. Site was not cleaned, fire ring overflowing with past campers excess, and site needed to be raked. Had to ask the front desk to take care of. Last year it was already done when we arrived and that was right after Labor Day. This year we visited end of September and facilities were a disgrace. Half of the showers and toilets were closed with signs saying "closed for season" because they close October 31st. It was still a month away. There were two young men traveling around on a go cart cleaning bath houses, but you couldn't even tell they were there. A real disgrace. Big difference from a year ago. WiFi was only available at Camp Store or right outside at a picnic table. You had to pay for the internet access at your sight. Only reason to stay here was to have close access to Ocean City. I will not be staying here again. We camped at Whippoorwill Campground in a Motorhome. Nice campground but the spaces are tight, though there are very nice staffers who are here to guide you into your site . The roads are very narrow. Too many seasonals. They are dog friendly but there is no where to walk the dogs or allow them to be off-leash for a little while. (That would be a major help in tiring them out and for us to enjoy our time camping too.) There are a lot of dogs. Still a nice place though. The pool was nice but had an adult spa rather than a kiddie pool, which would have been a better use for that little gated area. The staff was very nice. The girls in the camp store were very helpful . Smaller size trailers will do well here. It's close to the beach and well maintained. We camped at Whippoorwill Campground in a Travel Trailer. This is the 5th time we have stayed at this campground and will be back for sure. We always visit during the off season to avoid the crowds since we are retired. The discount rate is also nice during the off season. Yes, the roads are narrow but can be navigated easily if you just go slow. Backing into the sites has never been a problem. The sites are perfectly level and most are a very nice size. Our site is plenty deep and we still have room to park the car in front of the motorhome. On each side we have 25 to 30 feet of space to the next RV. Yes, there are seasonal park models here, but they are all very nicely maintained. We have been RV'ing for 37 years and rate this campground as a 7 or 8. You will not be disappointed. Oh, almost forgot to mention: it's only a short 3 miles drive to the boardwalk of Ocean City, NJ. We camped at Whippoorwill Campground in a Motorhome. We stayed here over the Memorial Day weekend. It was our first time at this campground. Upon check in we were told that we would have to pay an extra fee because it was supposed to be a hot weekend and everyone would be using their air conditioners! A good percentage of the park is seasonal, park model trailers so it has the trailer park theme. It is NOT big rig friendly, roads are narrow with many trees and only one road out. Many trees also meant many bugs, gnats, mosquitoes, and ants on everything! The pool area was nice but open to the public so it got crowded along with parking near the entrance. Wi-Fi only in a small area. Playground nice and looks like they're upgrading around the tennis court. The younger staff were friendly and helpful but management was rude & discourteous. There are a lot of campgrounds in this area and we will stay somewhere else next time. Definitely won't be back! We camped at Whippoorwill Campground in a Fifth Wheel. 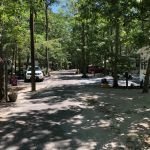 This campground is located near Ocean City NJ and is convenient to Cape May County shore points. We were happy with the wood like setting and the location to the shore. However, this campground is NOT big rig friendly. There are NO pull-throughs in the campground and because of trees and narrow roads, it is virtually impossible to back in without major effort as well as inevitable damage to the coach. Wi-Fi is only available at the snack bar and the service is not reliable. Management has changed and the friendly atmosphere we knew for 5 years has disappeared. The pool is very nice and fairly well-kept. The downside is that the owners open it to the public so it can be extremely crowded at times. We are disappointed in the change of management and in the rudeness that was shown to so many campers.It is not very camper-friendly. We will not return to this campground. We camped at Whippoorwill Campground in a Motorhome. When we arrived,site was full of cigarette butts and wood ashes. The overly solar heated to 95 degrees swimming pool is packed on the weekends, as it is open to the general public. Place is probably 75% permanents. Access roads are very narrow and turns are tight. I would have given it a slightly higher rating if it were about $40 /night. We camped at Whippoorwill Campground in a Motorhome. We stayed at this campground just as a retreat from the rainy weekend near our home. It was only a two hour ride south so it was worth it. The staff seemed friendly enough and being off season, allowed us to essentially pick our own spot. What we found was a campground that was being allowed to become rundown. The picnic tables were rotting and the fencing around the tennis court had the gates lying on the ground. Perhaps since this was the next to last weekend they were planning on going over it after the park closed for the winter. We did notice that a high percentage of the seasonal occupants were living in the "Park Trailer" style mobile homes with attached sun rooms. It reminded me more of a trailer park then it did a campground. The main road in and out is pretty tight for a 37 foot MH so you have to look close to miss the trees. Although they advertise Wi-Fi, we were only 200 yards away from the office and had such a weak signal that it was useless. When we pulled out I decided to fill my Propane tank but found I should have asked how much first. At $4.00 per gallon that cost me $67.00. Live and learn. Although we did have a pleasant stay, this was near the shore so the sites were 100 percent sand and that was too much of a hassle keeping it out of the motor home that we most likely won't go back. I'll look for a place with cement or gravel when I do go back to the shore. We camped at Whippoorwill Campground in a Motorhome. This campground is a great location for visiting Ocean City. Enterprise car rental comes to location if rental car is needed. Close to old bridge crossing bay where you can walk, rent boats, etc. Grocery shopping close by as well. Staff friendly and helpful. On site breakfast/lunch place. Large pool with activities. We camped at Whippoorwill Campground in a Motorhome. Nearby Chinese food is pretty darned good, with 2 choices available. Island Shore or Fai's. Chinese food isn't easy to get down the Shore. So, this is a bonus. Plus there is always the Lobster House in Cape May. Skip the middleman and buy your seafood here...or eat outside (less expensive) or inside (more expensive). Are you affiliated with Whippoorwill Campground ?